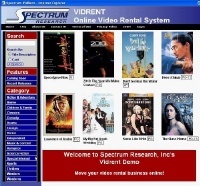 Spectrum VidRent is an web based / online DVD video rental software system designed to fill the needs of video rental firms renting DVDs over the internet. It is engineered to provide ease of use, whether by a rental customer or the company's System Administrator. The VidRent video rental software is built on Active Server Page technology and uses a Microsoft SQL Server 2000 database to store movie information. VidRent was first used by Gold Entertainment Group, Inc., and their 5000 distributors and customers for almost a year before they (like others including Walmart) fell victim to the recent video rental company price wars and ceased operations. VidRent is no longer available. Click VidRent to check VidRent out! Customers can browse through the database of available videos, or login and rent a video. Administrators are given virtually complete access to all system functions. Import data from supplier database. Customer Support employees have special screens that they can use to manage customers. The look and feel of the portal is easily customizable, since it makes heavy use of Cascading Style Sheets. The rest of the look and feel is controlled by a small number of ASP pages that can easily be changed.